For the song by Brian Eno, see Backwater (Brian Eno song). 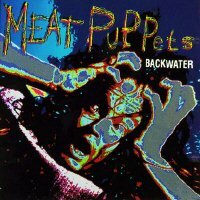 "Backwater" is a song recorded by the Meat Puppets. It was released as the first single from the group's album Too High to Die. The single was released in three versions: one promo CDS and two singles. It is the Meat Puppets most successful single. The highest position in the US was No. 47 in Billboard Hot 100, No. 2 on the Billboard Album Rock Tracks chart, No. 11 on the Billboard Modern Rock Tracks chart and No. 31 on the Billboard Mainstream Top 40 chart. The 3 track single features a cover of the Feederz. They Might Be Giants sing back-up vocals on "White Sport Coat." ^ "Meat Puppets - TMBW: The They Might Be Giants Knowledge Base". Retrieved 16 April 2017. "I Can't Be Counted On"
This page was last edited on 20 November 2018, at 17:55 (UTC).